Around 15 years ago, at Child Psychopathology class, my favorite lecturer shared her own experience of handling separation anxiety symptoms showed by her son. Back then she had to leave her two-year old son to pursue her study at the Netherlands. When she returned, her son started to show specific behavior, in which he would touch my lecturer and whisper to himself: Mommy is here. Then he would walk toward the door, just to return and do it all again for several times. That story sticks with me throughout these years as I met numerous children at my professional life. And turns out, I have to face it now with my son. I just returned from a week long business trip. I was feeling abnormal to leave him at home for so long. I had no doubt that my parents and family will look after him very well, but at the same time, my guilty feeling strikes. The thought of ‘I should’ve stayed longer at home with him’ was never out of my head. Two days ago, I was spending time with him in re-arrange his toys and cleaning up the shelves. 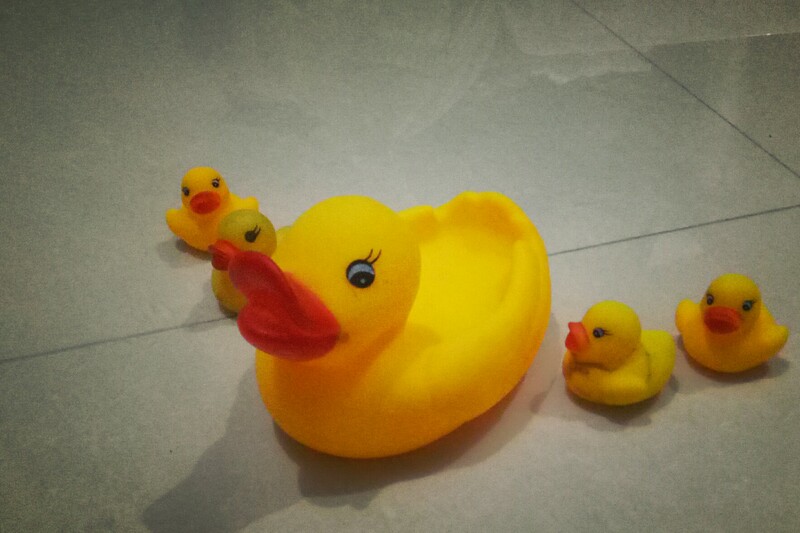 He reached out to his rubber ducks – with one mother duck and four ducklings. He was choosing the mother duck and said to himself: Mama. I was watching him closely. When he finally touch the mother duck to me and said: Mama again… I knew something was not right. I asked him, did you miss Mama so much when I was away? He nodded. Then he stood up and hug me. He is only twenty months old, but he certainly knows how to express his feeling. It is killing me as I know what is the message that he conveys to me. Last night, he insisted to bring his mother duck to bed. I was next to him and whispered to him that he doesn’t need the rubber duck, as I am there with him. I believe this is the challenge that every working mom can relate to. Therefore, it is very important to always remember what is our priority. I heard a lot of super moms who finally put down their careers for their children. Brave decision can only be taken by brave people. I hope I do remember my priority and act accordingly.